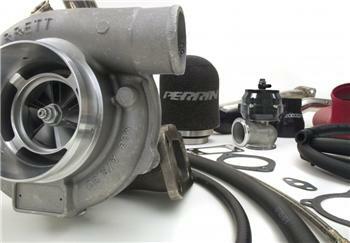 PERRIN Rotated Turbo Kit - Dezod Motorsports Inc - Home of the automotive performance enthusiast since 2002. Looking for 100-200 Wheel HP gain over your current setup? Looking to make up to 450 Wheel HP? The PERRIN Rotated GTX turbo kit is the answer. Every PERRIN turbo kit comes pre-assembled, including all necessary items to install on your WRX/STI (with a Front Mounted Intercooler.) With many years of production under our belts, you will feel confident that this kit will last and perform. PERRIN Turbo kits are not for the faint of heart and it is best to speak to a PERRIN specialist before ordering. Let us help choose the exact combination of turbo and exhaust housings to meet your needs. We can help you choose the extras that make this project successful from things like ECU tuning tips, recommended engine internals, injector size, fuel pumps, etc. PERRIN Rotated Turbo kits are designed for customers that are looking for 400+HP, something bigger and more efficient than a stock location type turbo. Every PERRIN Rotated Turbo kit is designed around Garrett GT30R, GTX30R, GT35R and GTX35R turbochargers, which can support 600+ Wheel HP! Each kit come pre-assembled and includes a Tial 46mm Wastegate, large 3” Intake system with MAF, 3” downpipe with built-in wastegate recirc tube, boost tube connection for Front Mounted Intercooler, and all other parts needed for installation. When you buy a PERRIN rotated turbo kit, we take the time and pre-assemble the entire kit before shipping to ensure that everything fits perfectly and makes your installation a breeze. Once the OEM parts are removed, is as simple as hooking it up to your header, cat-back, oil feed and coolant hoses and your done! We do this to ensure that turbo is clocked properly and that the oil drain and coolant connections are oriented properly. This saves an enormous amount of time for the DIY’er or shop installing your kit. The PERRIN GT3076R kits are able to produce roughly 550 engine Horsepower, but we have seen as high as 450 Wheel HP. Choosing the .82AR turbine housing over the .632AR turbine housing will add roughly 20WHP and add roughly 250 RPM of turbo lag. If you are looking for more HP see the Garrett GTX rotated turbo kits or the GT3582R kit. Both of which will make more power at the sacrifice of turbo lag. The PERRIN GTX3582R kits are able to produce roughly 740 engine Horsepower, but we have seen as high as 650 Wheel HP. Choosing the .82AR turbine housing over the .63AR turbine housing will add roughly 30WHP and add roughly 250 RPM of turbo lag. If you are looking for more HP consider the .82ar housing or the 1.06ar housing. Every kit comes with a 3” cold air intake system that reaches down to your inner fender to supply fresh cold air to your Garrett GT turbo. Each intake includes a built in MAF housing and a recirculation pipe for your Blow off Valve to make sure your car runs as smooth as possible. Also included are fittings for your crank case breathers which are positioned for easy connecting of an Air Oil Separator. PERRIN intake systems always include a 2 piece high flow foam filter element, perfect for large turbo applications. Also included are silicone adapters, and vacuum hoses for the installation. A significant amount of exhaust gases are needed to flow through a wastegate in order to control boost properly. We chose the TiAL MV-R wastegate (44mm size valve) for its compact nature, and its ability to flow extreme amounts of air. Their High quality NiCrFe based alloy valves and 347SS valve housings offer longer product life compared to competing designs. A 17-7 PH Stainless Steel actuator spring gives consistent pressure at high temperature, resisting “relaxing” at high temperatures. 3 lower ports and two top ports for easy install, no need to rotate the actuator top at all, plugs included for unused ports. Also now has Integrated -4 AN water cooling ports that cycle a small amount of coolant through the actuator top to keep the temperatures down in extreme conditions such as road racing. We install a 14psi WG spring into each kit, as well as include springs to run up to 25psi of boost! We have chosen Garrett turbochargers for our rotated turbo kits because of their proven real world performance and their wide range of available choices that allow us to tailor a kit to your exact needs. We have been using these turbos since early 2005, but Garrett has been around since 1954 providing the world with OEM and aftermarket turbochargers. Not to mention been a large part of nearly all forms of racing, supplying Champ Cars, 24 Hours of Le Mans, Pikes Peak Hill Climb, WRC, and Drag Racing cars with high performance turbochargers. GTX Turbos take the Garrett technology to the next level. The GTX turbos provide 10-20% more airflow and 10-20% more pressure capabilities, forge fully machined billet compressor wheel with next generation aerodynamics, 11 full blade design and ultra quiet operation. All this mean more HP with no change to the turbo response or overall size of turbo! Customize your turbos response and top end power by choosing the desired turbine housing. Most commonly .63AR, and the .82AR are available and 1.06AR housings are available upon request. Larger AR turbine housings flow more air, but with increased turbo lag. Smaller turbine housings flow less air but decrease turbo lag. Its a trade off, as a smaller AR housing will be more responsive but make less peak power. Where a larger AR turbine housing that will be less responsive but make more power. On the GTX3582R turbo a .63AR housing builds full boost around 4200RPM where a .82ar housing builds full boost around 4500RPM but is worth about 30 Extra Wheel HP across the RPM band. Typically we suggest .82AR and if you are looking for more responsive, the GTX3076R is a better choice.